The Q300T ES is a large chamber, turbomolecular-pumped coating system ideally suited to metal evaporation onto large diameter specimens up to 6”/152 mm (for example a wafer) or smaller multiple specimens. The Q300T ES also comes with interchangeable sputtering and carbon evaporation inserts to allow a coating radius of up to 4”/102 mm. The sputter coating insert will deposit both oxidising metals, e.g. chromium and aluminium and non-oxidising (noble) metals such as gold and platinum. A chromium target is fitted as standard. The Q300T ES has a full range of optional accessories, including specimen stages and film thickness measurement which means the system can be tailored to the precise requirements of the user. The Q300T ES allows controlled thermal evaporation of metals onto large substrates (up to 6”/152 mm). For many evaporative processes tungsten filaments supplied with the system are used. However, some metals require the use of a molybdenum boat, which can also be used for heat-cleaning SEM and TEM apertures. The evaporation head is normally positioned for downwards evaporation, but for small specimens upward evaporation is possible using two terminal extensions supplied with the system. The advance design of sputtering head, power supply and system control allows sputtering of both oxidising and non-oxidising (noble) metals for thin film applications and for scanning electron microscopy (SEM) coating. The range of target materials available is extensive and detailed in the Ordering Information section. For sputtering applications where thick films are required, then the Q300T ES can operate for up to 60 minutes. The carbon rod evaporation insert allows high quality carbon films to be deposited over a radius of up to 4”/102 mm. The Q300T ES uses controlled ramped carbon rod evaporation to ensure optimum control of the process and quality of results (with or without the optional film thickness measurement system). In addition the quality of the resulting carbon films is enhanced by the eradication of "sparking" which is a common problem with less advanced coating systems. The Q300T ES is fitted with an internally mounted 70 L/s turbomolecular pump backed by a 5 m3 hr two-stage rotary pump (order separately). A full range vacuum measurement gauge is included. Typically ultimate vacuums of around 5 x 10-5 mbar can be expected in a clean system after pre-pumping with dry nitrogen gas. At the operational heart of the Q300T ES is a colour touch screen which allows users to rapidly enter and store their own process data. A range of typical sputtering and evaporation profiles are pre-installed. The Q300T ES uses an 'Intelligent' recognition system that automatically detects the type of coating insert fitted and "becomes" either a evaporator, carbon coater or sputter coater. The Q300T ES is presented in a custom-moulded, one-piece case allowing easy servicing access. The case houses all the working components and includes an automatic bleed control that ensures optimum vacuum conditions during sputtering. The vacuum chamber has an internal diameter of 283 mm/11” and comes with an integral safety guard. 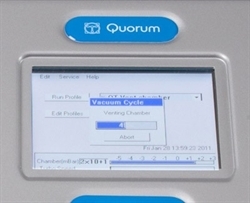 The vacuum shutdown option can enhance vacuum performance by allowing the chamber vacuum to be maintained when the coater is not in use. A variable speed rotary specimen stage is fitted as standard and accommodates specimens up to 4”/100 mm in diameter. A suitable rotary vacuum pump is required. The Pfeiffer DUO 6 5 m3/hr two-stage rotary vacuum pump is ideal for this purpose. Dry pumping alternatives are also available. See: Ordering Information for more details. 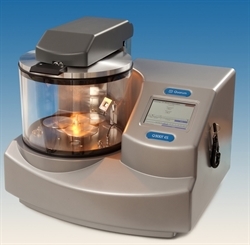 The Q300T ES has additional specimen stages to meet most requirements. All are easy-change, drop-in style (no screws) and are height adjustable (except 10360). Rotation speeds are variable between preset limits. 10787. Rotation stage for 4” wafers (supplied as standard). 10810. Rotation stage for 6” wafers. 10067. Flat rotation stage for SEM specimen stubs. 10357. Rotation stage with pre-set tilt for SEM specimen stubs. 10358. Rotation stage for glass microscope slides. 10808. Eight-place stage for 25 mm or 30 mm embedded polished specimens. 12996. "Sun and planets" style rotary stage. Three platforms, each 92 mm Ø. 12043. Microscope coverslip stage for nine 20 mm x 20 mm coverslips. 10595. Extended height chamber (supplied with the Q300T ES). 10454. Film thickness monitor (FTM). 12937. Conductance film monitor (CFM).